Requirements for Multiple-entry and Single-entry Visas for short term stay are revised. Please download a check list. *Please carefully read the following below for visa information. I. Visa application are accepted only from residents in our jurisdiction. Proof of residence such as your California/Nevada Driver’s license/ID card, utility bill, etc. is required. Visa applications must be submitted in person. No reservation is required. There is NO ONLINE Visa process. Please be aware of fraudulent websites, social media and emails. Normally, a visa can be issued within 5 working days if all the requirements are met. There are, however, some cases or nationals where referrals to the government office in Japan are necessary. In such cases, it may take around 1-2 months for results. 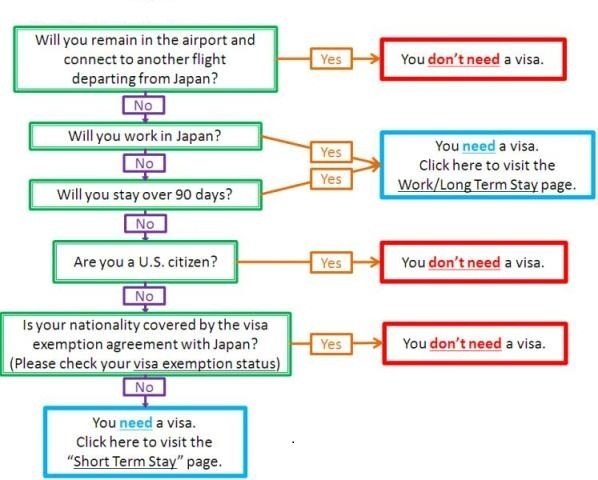 Therefore, early planning for your trip to Japan is recommended. No fee is required for U.S. citizens. For other nationals: visa fees page. We accept cash, money order, or cashier's check which must be payable to "Consulate General of Japan". Personal checks and credit or debit cards are not accepted. (1) The applicant possesses a valid passport and is entitled to re-entry to a country of his/her nationality or country of his/her residence. (2) All submitted documents shall be authentic, completed and satisfactory. (4) The Applicant does not fall under any of the items of Article 5, Paragraph 1 of the Immigration Control Act. Although a visa is one condition that allows you to land at an airport or seaport, you should note that a visa does not guarantee landing permission. You must obtain landing permission during immigration procedures. An applicant with a criminal record must provide a copy of his/her court conviction or sentence, along with an English translation of those documents if they are in any language other than English. We would like to know about the charges, time served, fees paid, and probation (if any). If you have such a record, please call our office in advance. *Please arrive no less than 30 minutes before noon to submit visa applications during our AM hours. Due to the high volume of applicants during our AM hours, you may be required to return after 1:00p.m., to submit visa applications during our PM hours. 9:00a.m. to 5:00p.m., closed from noon to 1:00p.m. * Due to the high volume of applicants during certain peak seasons, we may not be able to answer your call during our business hours.